I was very humbled and honored to have the opportunity to share my love of albums and printed work with the readers of Design Aglow blog during Design Aglow's IPS week 2017. For those of you who do not know, Design Aglow is a fantastic resource for photographers regarding educations, templates, and workflow products. As well, they offer product resources for albums and frames as well. Having an opportunity to share my love of printed products and why they mean so much to me was super exciting! While I know that the information is geared more to fellow photographers, I wanted to share it here as well because I hope that it gives you the client an insight into why the Brooke Price Photography brand is making such a large move to phase away from digitals as the focus. Because your story is amazing, how you view it should be too! I believe that you deserve to have all this awesome in your world because as my clients, you've already given me so much awesome in mine! Original article HERE on the Design Aglow blog. Some of my absolute favorite things in this world are our wedding albums. Selected especially for the BPP brand, we have a curated collection of heirloom albums that are sure to shine for years in your home. Nothing quite compares to the beauty of holding your images in print. We'd love to show you one of our gorgeous albums in person! Contact us today to set an appointment! And if you can't quite make it to us in person, feel free to enjoy the video below! Again, another amazing couple who decided to have a destination bash in FL with me! I adored this couple. Their friends were utterly amazing. When I think of what a celebration needs to be a great time, I always think of a group of people who truly celebrate the couple and their day. Like, celebrate as if it is a professional sport or their job. Everyone you encountered on the day had something amazing to say about Jimmy or Taylor, or Jimmy + Taylor together as a couple. They commented about how genuine and wonderful they are as individuals and then about how they perfectly compliment one another. By far, their first look has been my favorite thus far. The sheer raw emotion shown makes you catch your breath. This couple. Their people. This is why I love what I do. The entire feel of the wedding was light and casual. The girls hair styles were a sophisticated mismatch of bohemian up do's. The ladies of Destiny & Light did a fantastic job on the hair and makeup for each of the girls, and I know they felt special and beautiful. The fellas were looking dapper in tailored gray suits with pops of mint to compliment the breezy (oh so perfect for Florida) bridesmaids dresses. Jana of, Floral Artistry of Sanibel, and her team worked their magic in the florals. The bride's bouquet was lush with white and lilac roses, gorgeous greenery, and these perfect little pops of coral/peach in the surprise add of hypericum berries. The bridemaids' bouquets were lilacs, hints of blue, and lush greenery. Jimmy was the only one to receive a boutonniere for the day, and I loved that it complemented Taylors bouquet with peach roses that brought out the color surprise in her bouquet. Everything worked together and was reminiscent of a Southwest Florida sunset. The staff of The Hyatt Regency were above and beyond, and just reminded me why this location is one of my favorites in the area, and we have many! The pastry chef made a gorgeous and understated cake for the pair, that was gluten free ( for the bride) and delicious! The group ended the night with some of the most heartfelt speeches I've ever been privileged to at a wedding, and lots and lots of dancing! Unlike some weddings, Jimmy and Taylor didn't focus on a million little details, they focused on the people around them. They prioritized, good food, a good time, and making sure that everyone who came to their destination wedding felt loved. As much as the guests celebrated Jimmy and Taylor, they were celebrated themselves. For their love, support, and unending friendship. Where do I even begin with this amazing couple? The two of them embody laughter and warmth. 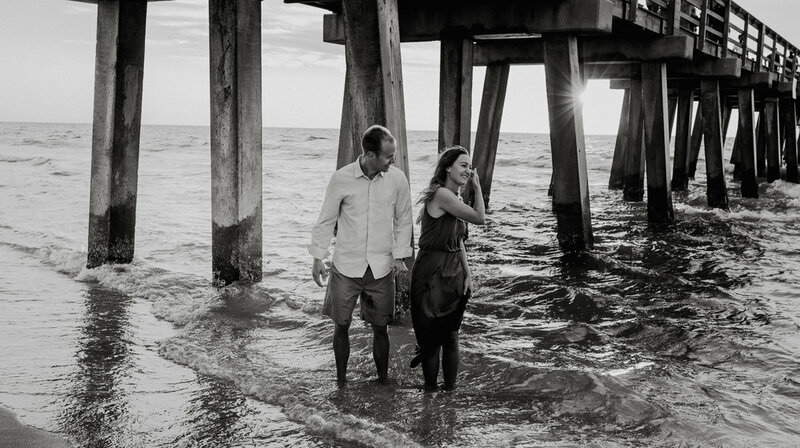 So many amazing little quirks appear in their destination wedding that was held at La Playa resort in Naples, FL. Tiny pineapples in the bouquet and boutonnière. Sunglasses for All! For the guests. The mismatched but perfectly coordinated dresses of the bridesmaids, and of course, Floyd. Floyd the 3ft inflatable flamingo who became the unofficial wedding mascot. I adored this destination wedding for the fun and joy that the entire group brought to it and for Floyd, because having a flamingo at your wedding is pretty awesome. This post is so photo heavy for the photographer picks, please click on each photo to see it larger.